In September, 2016, the creation of the 501st Legion Make-A-Wish Endowment Fund was announced. We challenged ourselves to raise $150,000 by September 2021 to grant Star Wars related wishes involving Legion appearances. WE DID IT! Thanks to YOU and some of our most loyal supporters, we achieved that goal in just 10 months! Thank you so much for supporting the endowment and helping to spread the word. So let's keep it going! Now we have a new challenge - a goal of raising a total of $501,000 by September, 2021 in honor of the 501st Legion. This will grant even more wishes each and every year, forever. Your support makes a difference. The 501st Legion is an all-volunteer, non-profit organization dedicated to bringing beloved Star Wars characters to life. Founded in 1997, the 501st Legion seeks to promote interest in Star Wars fandom, through the building and wearing of quality costumes. Along with our sister organizations, The Rebel Legion, Mandalorian Mercs, R2 Builders and Saber Guild, the group facilitates the use of these costumes for Star Wars-related events, as well as contributions to the local community through costumed charity and volunteer work. 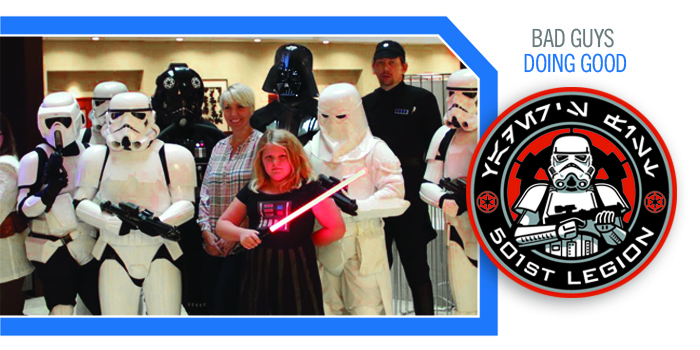 Together these clubs have united in support of the 501st Legion Make-A-Wish Endowment Fund. 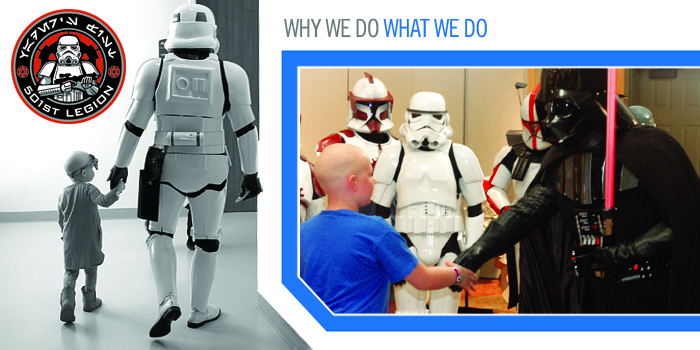 For over ten years, the 501st Legion has raised thousands for varied Make-A-Wish® chapters, all over the globe. The 501st Legion Make-A-Wish Endowment Fund allows the organization, with over 9,500 members in over 60 countries, to band together for an even greater global impact. The endowment fund will rely on contributions from its membership and through various fundraising events held in support of Make-A-Wish by its members. This endowment will allow Make-A-Wish America and Make-A-Wish International to grant more Star Wars-related wishes to children diagnosed with life-threatening medical conditions - a first for an endowment of this kind. Our goal is to raise $150,000 by September 2021. Once the minimum gift is achieved, the Endowment Fund will grant wishes from the interest accrued; as the fund continues to grow, so will the number of wishes granted by the endowment. The 501st Legion thanks you for your support in helping us reach this goal and fulfilling the wishes of children around the world. A bit of help from each of you can deliver a lot of strength and joy, transforming the lives of children fighting critical illnesses. May The Force™ Be With You! GISHWES Team ALL THE THINGS!